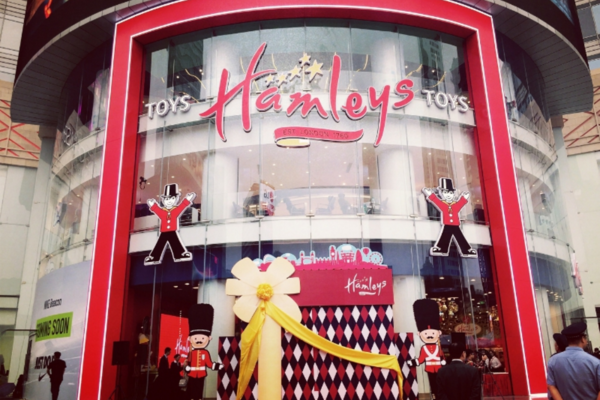 Heritage British toy brand and retailer Hamleys has opened a new flagship store in China. Situated in Xinjiekou Sanpower Plaza in Nianjing, the store – dubbed “super Hamleys” – opened last weekend on National Chinese Day (October 1) and spans four floors and 7000sq m.
Its famous range of teddy bears will be stocked alongside heritage toy brands Lego and Hasbro, among thousands of other educational toys aimed at all age groups. It hosts 10 different interactive games such as remote control car racing and virtual reality games spanning the entire building. This will be the first venture into China for Hamleys, which is already dominating the global toy market. Aside from “super Hamleys”, the entertainment giant plans to expand its presence in China to over 100 stores in the coming year aiming at key cities like Beijing and Shanghai. Hamley’s was acquired by C Banner International Holdings in 2015, which is a strategic partner of Sanpower, who own a majority of House of Fraser outlets in the UK. The chairman of Sanpower Group Yuan Yafei said that Hamleys can bring its interactive business model to China and cooperate with House of Fraser to give it a competitive edge. Posted on October 8, 2016, in Other. Bookmark the permalink. Leave a comment.